This is a question that every generation struggles with, and there are a multitude of answers. God is true. God is real. God is good. Brian Chung and Bryan Chung also describe God another way: beautiful. The concept of beauty and furthermore our understanding of it has evolved as time has progressed. Bryan stated that, "Historically speaking, beauty was always more of a thought connected to things that are transcendent. If you look at Plato, his thoughts on beauty were that it's beautiful if it is [...] serving a moral purpose." He also believes that beauty in the modern age is now a concept that provides individuals the ability to communicate ideas we otherwise wouldn't be able to communicate. Within a Christian context, this means being "able to communicate things about God, about faith, about Christianity, that people otherwise wouldn't listen to." Bryan expanded upon this concept further when he discussed the predominance of aesthetics in today's society, especially how individuals have a particular aesthetic of beauty that they are drawn to. He stated, "First of all, you can't deny your aesthetic because God said that was the aesthetic you like, and your aesthetic is communicating characteristics of God that dominate your experience of who God is." He offered that part of his personal aesthetic was the abstract and how, through that, he understands that the mystery of God is a characteristic that is important to him. Brian agreed with this, saying, "There is something about beauty and your aesthetic that is communicating parts of God." 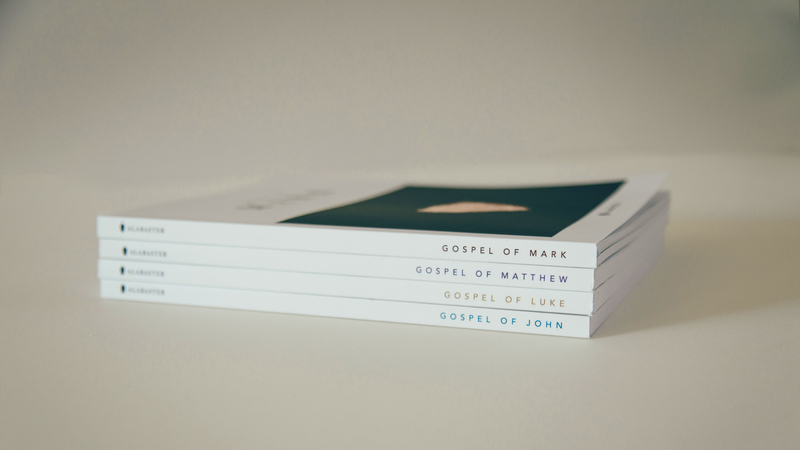 Brian and Bryan are exploring the beauty and aesthetics of God through their project "Alabaster," a set of the Gospels that integrates imagery, typography, layout, and other elements of design with God's Word. 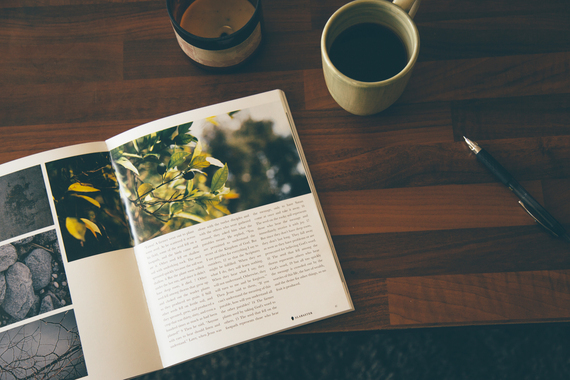 Each Gospel is ninety-six pages, and every page spread includes carefully selected photography and layout inspired by the featured passage. Brian elaborated upon the design process, stating, "We're thinking about the layout and the spreads, but, in production, we are also thinking about what type of paper it is, how heavy is the paper, what is the feel of it is, how does it feel when you open it." The experience they want "Alabaster" to provide is an integration of beauty and faith, and every detail gestures to that. This thorough design process is brimming with intention, particularly in what Brian and Bryan hope to convey to future readers. One of the messages they would like to share through "Alabaster" is that being an artist matters to God, which relates to their own experiences as artists. While attending the University of Southern California, Bryan was an animation major within the School of Cinematic Arts, and, though he attended Intervarsity, one of the Christian communities on campus, he felt as though his faith was very separate from his academia and art. "Animation and visual effects was what I did as a job to make money, and then my life with God and Intervarsity was a completely different thing," Bryan explained. During his senior year, he realized that he wanted to explore larger questions of beauty in the context of our culture, of our communities, and of God. "Alabaster" was the result. Similarly, Brian, also an alumni of the University of Southern California and the on-campus Intervarsity community, believed that "Alabaster" was a culmination of his experiences and abilities. "I've just always loved business and art and God, so being able to intertwine all my three of passions into this project has been awesome. I love it," he described. Another hope for "Alabaster" is that the series of Gospels conveys how beauty can purposefully communicate who God is. Bryan expanded upon this, saying, "It's about showing people that beauty is important to God. It's more than just a pretty thing. As our culture is becoming more visual and our culture cares about beauty more and cares about the aesthetic of things, and how can we, as a Christian community, use that to communicate who God is. That goes back to the whole beauty as communication, and that's important. [...] We just want to show that beauty matters." Beauty and God are not two separate entities, particularly where imagery is concerned, and Brian and Bryan want to explore how they intersect and how beauty reveals God through a beautiful artwork of their own. They wanted to offer up at least one of many answers to the question of who God is. According to Brian and Bryan, God is not constrained to a textual medium comprised entirely of words; his identity is much greater than that. As Brian concluded, "We want to let folks know, especially people who don't know who God is, that God is beautiful. He's all those three things: true, real, good, but also beautiful."